Statesboro has always been animal friendly, with dogs in particular serving on farms, being companion animals, and serving as friends. Our local dogs however, are confined to being on leash because despite having parks and recreation areas, there is no free roaming for dogs. These parks are dog-friendly in the sense of allowing dogs on site but they are not dog focused. The idea of a dog park (off-lease area) is nothing new for most communities and Statesboro is no exception. In fact, the idea of a dog park in Statesboro has been talked about for many, many years by long-time residents and newcomers alike. However, it seemed that no one really knew how to proceed until the past 2 years when Statesboro decided to participate in the America’s Best Community competition. Several locations for a proposed dog park have been discussed and talked about. Finally a decision was made to consider a spot along Greenway called the Blind Willie McTell Trail. This trail is a fairly recent addition to Statesboro and trail consists of 7,415 square yards of architecturally designed asphalt, six varieties of trees, custom-designed benches by the university’s art students, cobra lighting throughout and more. Bike racks, picnic tables, trash receptacles, landscaped islands, raised pedestrian crosswalks and much more. The McTell Trail allows visitors and locals alike to walk and picnic during their lunch hour, cycle safely, and most importantly walk their dogs safely without using city streets. Our new dog park is centrally located on the trail on East Cherry Street. Through the collaboration of several community organizations we were able to host the Grand Opening of the Downtown Dog Park October 6,2018. 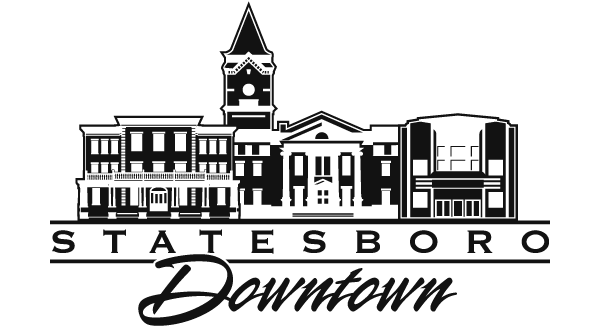 The Downtown Statesboro Development Authority held the ribbon cutting on site with the City of Statesboro, The Statesboro Bulloch Humane Society, Statesboro Bulloch Chamber of Commerce and The Statesboro Bulloch Tree Board, beautification committee. We want to thank Pioneer Designs for creating a brand and logo design for our new park. Sponsor the Downtown Dog Park! Want More Information or Volunteer?